"Alani" redirects here. For the Hawaiian plants, see Melicope. The migrations of the Alans during the 4th–5th centuries AD, from their homeland in the North Caucasus. Major settlement areas are shown in yellow, Alan civilian emigration in red, and military campaigns in orange. The name Alan is an Iranian dialectical form of Aryan, a common self-designation of the Indo-Iranians. Possibly related to the Massagetae, the Alans have been connected by modern historians with the Central Asian Yancai and Aorsi of Chinese and Roman sources, respectively. Having migrated westwards and become dominant among the Sarmatians on the Pontic Steppe, they are mentioned by Persian and Roman sources in the 1st century AD. At the time they had settled the region north of the Black Sea, and frequently raided the Parthian Empire and the Caucasian provinces of the Roman Empire. In 215–250 AD their power on the Pontic Steppe was broken by the Goths. Upon the Hunnic defeat of the Goths on the Pontic Steppe around 375 AD, many of the Alans migrated westwards along with various Germanic tribes. They crossed the Rhine in 406 AD along with the Vandals and Suebi, settling in Orléans and Valence. Around 409 AD they joined the Vandals and Suebi in the crossing of the Pyrenees into the Iberian Peninsula, settling in Lusitania and Carthaginiensis. The Iberian Alans were soundly defeated by the Visigoths 418 AD, and subsequently surrendered their authority to the Hasdingi Vandals. In 428 AD, the Vandals and Alans crossed the Strait of Gibraltar into North Africa, where they founded a powerful kingdom which lasted until its conquest by the Byzantine Emperor Justinian I in the 6th century AD. The various forms of Alan – Greek: Ἀλανοί, Alanoi; Chinese: 阿蘭聊 Alanliao (Pinyin) in the 2nd century, 阿蘭 Alan (Pinyin) in the 3rd century – and Iron (a self-designation of the Alans' modern Ossetian descendants, indicating early tribal self-designation) and later Alanguo (阿蘭國) are Iranian dialectal forms of Aryan. These and other variants of Aryan (such as Iran), were common self-designations of the Indo-Iranians, the common ancestors of the Indo-Aryans and Iranian peoples to whom the Alans belonged. Scarcer spellings include Alauni or Halani. The Alans were also known over the course of their history by another group of related names including the variations Asi, As, and Os (Romanian Iasi, Bulgarian Uzi, Hungarian Jász, Russian Jasy, Georgian Osi, Moldavian Olani. It is this name that is the root of the modern Ossetian. 4. Now there was a nation of the Alans, which we have formerly mentioned somewhere as being Scythians, and inhabiting at the Lake Meotis. This nation about this time laid a design of falling upon Media, and the parts beyond it, in order to plunder them; with which intention they treated with the king of Hyrcania; for he was master of that passage which king Alexander shut up with iron gates. This king gave them leave to come through them; so they came in great multitudes, and fell upon the Medes unexpectedly, and plundered their country, which they found full of people, and replenished with abundance of cattle, while nobody durst make any resistance against them; for Pacorus, the king of the country, had fled away for fear into places where they could not easily come at him, and had yielded up everything he had to them, and had only saved his wife and his concubines from them, and that with difficulty also, after they had been made captives, by giving them a hundred talents for their ransom. These Alans therefore plundered the country without opposition, and with great ease, and proceeded as far as Armenia, laying all waste before them. Now, Tiridates was king of that country, who met them and fought them but had luck to not have been taken alive in the battle; for a certain man threw a net over him from a great distance and had soon drawn him to him, unless he had immediately cut the cord with his sword and ran away and so, prevented it. So the Alans, being still more provoked by this sight, laid waste the country, and drove a great multitude of the men, and a great quantity of the other prey they had gotten out of both kingdoms, along with them, and then retreated back to their own country. 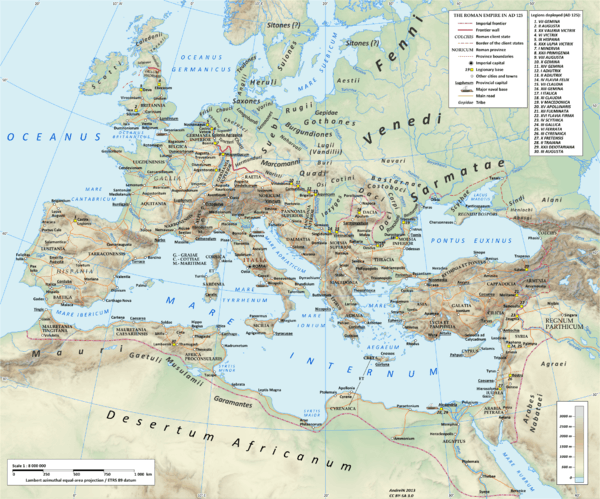 In 215–250 AD, the Germanic Goths expanded south-eastwards and broke the Alan dominance on the Pontic Steppe. The Alans however seem to have had a significant influence on Gothic culture, who became excellent horsemen and adopted the Alanic animal style art. (The Roman Empire, during the chaos of the 3rd century civil wars, suffered damaging raids by the Gothic armies with their heavy cavalry before the Illyrian Emperors adapted to the Gothic tactics, reorganized and expanded the Roman heavy cavalry, and defeated the Goths under Gallienus, Claudius II and Aurelian). The 4th century Roman historian Ammianus Marcellinus considered the Alans were "formerly called Massagetae," while Dio Cassius wrote that "they are Massagetae." It is likely that the Alans were an amalgamation of various Iranian peoples, including Sarmatians, Massagetae and Sakas. Scholars have connected the Alans to the nomadic state of Yancai mentioned in Chinese sources. Yancai is first mentioned in connection with late 2nd century BC diplomat Zhang Qian 's travels in Chapter 123 of Shiji (whose author, Sima Qian, died c. 90 BC). Yancai of Chinese records has again been equated with the Aorsi, a powerful Sarmatian tribe living between the Don River and the Aral Sea, mentioned in Roman records, in particular Strabo. Y. A. Zadneprovskiy suggests that the Kangju subjugation of Yancai occurred in the 1st century BC, and that this subjugation caused various Sarmatian tribes, including the Aorsi, to migrate westwards, which played a major role in starting the Migration Period. The 3rd century Weilüe also notes that Yancai was then known as being Alan, although they were no longer vassals of the Kangju. Under Biorgor (Biorgor rex Alanorum), they infested Gallia round about, till the reign of Petronius Maximus and then they passed the Alps in winter, and came into Liguria, but were there beaten, and Biorgor slain, by Ricimer commander of the Emperor's forces (year 464). 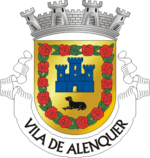 Coat of Arms of Alenquer (Alan-Kerk), in Portugal, which includes an Alaunt. Under Goar, they allied with the Burgundians led by Gundaharius, with whom they installed the usurping Emperor Jovinus. Under Goar's successor Sangiban, the Alans of Orléans played a critical role in repelling the invasion of Attila the Hun at the Battle of Châlons. After the 5th century, however, the Alans of Gaul were subsumed in the territorial struggles between the Franks and the Visigoths, and ceased to have an independent existence. In order to quell unrest, Flavius Aëtius settled large numbers of Alans in various areas, such as in and around Armorica. Several towns with names possibly related to 'Alan', such as Allainville, Yvelines, Alainville-en Beauce, Loiret, Allaines and Allainville, Eure-et-Loir, and Les Allains, Eure, are taken as evidence that a contingent settled in Armorica, Brittany. Other areas of Alans settlement were notably around Orléans and Valentia. It seems that the personal name Alan, which originated in Brittany, derives from these people. Following the fortunes of the Vandals and Suebi into the Iberian peninsula (Hispania, comprising modern Portugal and Spain) in 409, the Alans led by Respendial settled in the provinces of Lusitania and Carthaginiensis. The Siling Vandals settled in Baetica, the Suebi in coastal Gallaecia, and the Asding Vandals in the rest of Gallaecia. Although the newcomers controlled Hispania they were still a tiny minority among a larger Hispano-Roman population, approximately 200,000 out of 6,000,000. In 1253, the Franciscan monk William of Rubruck reported numerous Europeans in Central Asia. It is also known that 30,000 Alans formed the royal guard (Asud) of the Yuan court in Dadu (Beijing). Marco Polo later reported their role in the Yuan Dynasty in his book Il Milione. It's said that those Alans contributed to a modern Mongol clan, Asud. John of Montecorvino, archbishop of Dadu (Khanbaliq), reportedly converted many Alans to Roman Catholic Christianity in addition to Armenians in China. In Poland and Lithuania, Alans where also part of powerful Clan of Ostoja. Against the Alans and the Cumans (Kipchaks), the Mongols used divide and conquer tactics by first telling the Cumans to stop allying with the Alans and after the Cumans followed their suggestion the Mongols then attacked the Cumans after defeating the Alans. Alans were recruited into the Mongol forces with one unit called "Right Alan Guard" which was combined with "recently surrendered" soldiers, Mongols, and Chinese soldiers stationed in the area of the former Kingdom of Qocho and in Besh Balikh the Mongols established a Chinese military colony led by Chinese general Qi Kongzhi (Ch'i Kung-chih). Alan and Kipchak guards were used by Kublai Khan. In 1368 at the end of the Yuan dynasty in China Toghan Temür was accompanied by his faithful Alan guards. Mangu enlisted in his bodyguard half the troops of the Alan prince, Arslan, whose younger son Nicholas took a part in the expedition of the Mongols against Karajang (Yunnan). This Alan imperial guard was still in existence in 1272, 1286 and 1309, and it was divided into two corps with headquarters in the Ling pei province (Karakorúm). In 1254 Rubruquis found a Russian deacon amongst the other Christians at Karakoram. The reason why the earlier Persian word tersa was gradually abandoned by the Mongols in favour of the Syro - Greek word arkon, when speaking of Christians, manifestly is that no specifically Greek Church was ever heard of in China until the Russians had been conquered; besides, there were large bodies of Russian and Alan guards at Peking throughout the last half of the thirteenth and first half of the fourteenth century, and the Catholics there would not be likely to encourage the use of a Persian word which was most probably applicable in the first instance to the Nestorians they found so degenerated. The Alan guards converted to Catholicism as reported by Odorico. They were a "Russian guard". It is believed that some Alans resettled to the North (Barsils), merging with Volga Bulgars and Burtas, eventually transforming to Volga Tatars. It is supposed that Iasi, a group of Alans have founded a town in north east of Romania (about 1200–1300), near Prut river, called Iași. The latter became the capital of ancient Moldova in Middle Ages. In a study conducted in 2014 by V.V. Ilyinskyon on bone fragments from 10 Alanic burials on the Don River, DNA could be abstracted from a total of 7. 4 of them turned out as belonging to yDNA Haplogroup G2 and 6 of them had mtDNA I. The fact that many of the samples share the same y- and mtDNA raises the possibility that the tested individuals belonged to the same tribe or even were close relatives. Nevertheless, this is a strong argument for direct Alan ancestry of Ossetians and against the hypothesis that Ossetians are alanized Caucasic Speakers, since the major Haplogroup among Ossetians is G2 either. The ancient language of the Alans was a Northeastern-Iranian dialect either identical, or at least closely related, to Proto-Ossetic, which is confirmed by evidence left by John Tzetzes, a Byzantine poet and grammarian who lived at Constantinople during the 12th century and who was related to Maria of Alania. Tzetzes gave a few sentences in the Alanic language, along with Greek translation, in his 'Theogony', and most of the words in the sample have modern Ossetic counterparts including the greeting "Da ban xas" ("Good day") known from the Jász word list of 1422 as well ("Da ban horz", and comparable to the Digor "Da bōn xwārz" and Iron "Da bōn xōrz", the most common Ossetic greetings to this day. Most linguists regard the language of Tzetze's sample as Proto-Ossetic. In the 4th–5th centuries the Alans were at least partially Christianized by Byzantine missionaries of the Arian church. In the 13th century, invading Mongol hordes pushed the eastern Alans further south into the Caucasus, where they mixed with native Caucasian groups and successively formed three territorial entities each with different developments. Around 1395 Timur's army invaded Northern Caucasus and massacred much of the Alanian population. As the time went by, Digor in the west came under Kabard and Islamic influence. It was through the Kabardians (an East Circassian tribe) that Islam was introduced into the region in the 17th century. After 1767, all of Alania came under Russian rule, which strengthened Orthodox Christianity in that region considerably. A substantial minority of today's Ossetians are followers of the traditional Ossetian religion. 1 2 3 4 "Alani". Encyclopædia Britannica Online. 2015. Retrieved 1 January 2015. 1 2 3 4 "ALANS". Encyclopædia Iranica. Bibliotheca Persica Press. 2015. Retrieved 16 May 2015. 1 2 "Spain: Visigothic Spain to c. 500". Encyclopædia Britannica Online. Encyclopædia Britannica, Inc. 2015. Retrieved 1 January 2015. 1 2 "Vandal". Encyclopædia Britannica Online. Encyclopædia Britannica, Inc. 2015. Retrieved 1 January 2015. 1 2 Alemany 2000, p. ?. ↑ For ethnogenesis, see Walter Pohl, "Conceptions of Ethnicity in Early Medieval Studies" Debating the Middle Ages: Issues and Readings, ed. Lester K. Little and Barbara H. Rosenwein, (Blackwell), 1998, pp 13–24) (On-line text). ↑ Alemany 2000, p. 3. ↑ Alemany 2000, pp. 5–7. ↑ Vegetius 3.26, noted in passing by T.D. Barnes, "The Date of Vegetius" Phoenix 33.3 (Autumn 1979, pp. 254–257) p. 256. "The collocation of these three barbarian races does not recur a generation later", Barnes notes, in presenting a case for a late 4th-century origin for Vegetius' treatise. ↑ Hill, John E. 2003. "Annotated Translation of the Chapter on the Western Regions according to the Hou Hanshu." Revised Edition – to be published soon. ↑ Giovanni de Marignolli, "John De' Marignolli and His Recollections of Eastern Travel", in Cathay and the Way Thither: Being a Collection of Medieval Notices of China, Volume 2, ed. Henry Yule (London: The Hakluyt Society, 1866), 316–317. ↑ Isaac Newton, Observations on Daniel and The Apocalypse of St. John (1733). ↑ Paul the Deacon, Historia Romana, XV, 1. ↑ Bernard S. Bachrach, "The Origin of Armorican Chivalry" Technology and Culture 10.2 (April 1969), pp. 166–171. ↑ Bernard S. Bachrach, "The Alans in Gaul", Traditio 23 (1967). ↑ For another rapid disintegration of an ethne in the Early Middle Ages, see Avars. (Pohl 1998:17f). ↑ Ivo Xavier Fernándes. Topónimos e gentílicos, Volume 1, 1941, p. 144. 1 2 3 Barthold, W.; Minorsky, V. (1986). "Alān". The Encyclopedia of Islam, New Edition, Volume I: A–B. Leiden and New York: BRILL. p. 354. ISBN 90-04-08114-3. ↑ Sinor, Denis. 1999. "The Mongols jn the West". Journal of Asian History 33 (1). Harrassowitz Verlag: 1–44. http://www.jstor.org/stable/41933117. ↑ Halperin, Charles J.. 2000. “The Kipchak Connection: The Ilkhans, the Mamluks and Ayn Jalut”. Bulletin of the School of Oriental and African Studies, University of London 63 (2). Cambridge University Press: 235. http://www.jstor.org/stable/1559539. ↑ David Nicolle (January 2004). The Mongol Warlords: Genghis Khan, Kublai Khan, Hulegu, Tamerlane. Brockhampton Press. p. 85. ISBN 978-1-86019-407-8. ↑ Arthur Thomas Hatto (1991). Archivum Eurasiae Medii Aevi. Peter de Ridder Press. p. 36. ↑ Sir Henry Yule (1915). Cathay and the Way Thither, Being a Collection of Medieval Notices of China. Asian Educational Services. pp. 187–. ISBN 978-81-206-1966-1. ↑ Edward Harper Parker (1905). China and religion. E.P. Dutton. pp. 232–. ↑ Lauren Arnold (1999). Princely Gifts and Papal Treasures: The Franciscan Mission to China and Its Influence on the Art of the West, 1250-1350. Desiderata Press. pp. 79–. ISBN 978-0-9670628-0-8. ↑ John Makeham (2008). China: The World's Oldest Living Civilization Revealed. Thames & Hudson. p. 269. ISBN 978-0-500-25142-3. ↑ Jessee, Scott, and Anatoly Isaenko. 2013. “The Military Effectiveness of Alan Mercenaries in Byzantium, 1301–1306”. In Journal of Medieval Military History: Volume XI, edited by Clifford J. Rogers, Kelly DeVries, and John France, 11:107–32. Boydell & Brewer. http://www.jstor.org/stable/10.7722/j.ctt31njvf.9. ↑ Rogers, Clifford J., Kelly DeVries, and John France, eds.. 2013. Journal of Medieval Military History: Volume XI. Edited by Clifford J. Rogers, Kelly DeVries, and John France. Vol. 11. Boydell & Brewer. http://www.jstor.org/stable/10.7722/j.ctt31njvf. Brzezinski, Richard; Mielczarek, Mariusz (2002). The Sarmatians, 600 BC-AD 450. Osprey Publishing. ISBN 184176485X. Retrieved 7 June 2015. Zadneprovskiy, Y. A. (1 January 1994). "The Nomads of Northern Central Asia After The Invasion of Alexander". In Harmatta, János. History of Civilizations of Central Asia: The Development of Sedentary and Nomadic Civilizations, 700 B. C. to A. D. 250. UNESCO. pp. 457–472. ISBN 9231028464. Retrieved 29 May 2015.